The server ministry is open for any parishioner to participate, whether they are full or part-time resident of the Islands. This ministry provides servers at all weekend, major holy day and funeral Masses. Training is provided for those who request it. Contact: Jim Altemus at 843-768-1257. Parishioners who help in distributing the Eucharist during our Liturgies. Volunteers receive instruction on our Parish guidelines. Part time residents are welcome as volunteers. Each minister is scheduled approximately once per month and may be asked to occasionally fill in as needed. Contact: Greg Weigle at 843-670-8012. Lectors are volunteers who value their commitment to our Parish by presenting the reading of God’s word during liturgies. Part time residents are welcome to volunteer and are asked to submit their availability to the coordinator so that the schedule may be configured to accommodate them. 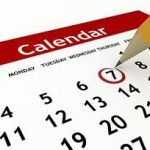 The schedule is published in three month increments, giving Lectors time to plan accordingly for their service or to secure a substitute if they are unable to fulfill the assignment given. Lector Handbooks are available to guide our Lectors as they prepare and plan for the proclamation of The Word of The Lord. Contact: Cathy Hilton by email. Liturgy assistants assure that all areas related to the function of the weekend liturgies are in place. This is a behind the scenes support to the flow of the Liturgy (ie. replacing the Orders of Worship, checking restrooms, retrieving lost items, answering visitors questions). Training is required and provided by the Parish. Contact: Joe Stocker at 843-768-0357. 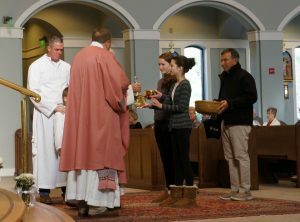 Participants are selected from the congregation prior to the beginning of Mass to carry up the offering. If interested in taking up the gifts, please introduce yourself to an usher on duty. Under the direction of the Sacristan, as the liturgical seasons change, this Committee enhances the environment of God’s house with flowers, greenery, colored tapestries, the Advent Wreath, the Christmas Crèche, and so on. Many hands are needed to transform the church for major feasts such as Christmas and Easter. Other duties include the weekly maintenance and rearrangement of flowers in the church and chapel. Contact: Joe Stocker at 843-768-0357. 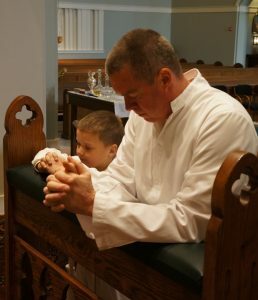 Mission Statement: The clergy and parishioners of Holy Spirit Catholic Church seek to promote the Kingdom of God on earth and the reconciliation of all God’s children. Office Hours: Monday-Friday 8:30 a.m. -4:00 p.m.